When Narendra Modi took up the initiative of "Clean India Campaign", the kind of response that the general public exhibited left us all overwhelmed. Well it looks like the intensity of the campaign is only increasing, day by day. From celebrities to ministers and even the common man, almost the entire nation has come together for the Clean India Campaign and social networks are simply flooding with it. Now the campaign has taken a new turn to create awareness among the children and youth as well. The leading cinema icons of the Indian film fraternity have been showing their eagerness to promote this campaign and now it’s Ilayathalapathy Vijay appearing in a new avatar for this lofty endeavour through the 'Clean India Mission' game. Throughout the game, the player is supposed to clear the streets off litter and make them clean. The game has the potential to bring a strong sense of cleanliness among children and it drives home the importance of keeping our nation clean. One of the main plus factors of the game is having Vijay as the primary player. The actor not only has a massive fan following but has also captured the hearts of children all along. It is worth mentioning that in his previous outing Kaththi, the actor had created a strong social impact among the masses. “This is an exceptional treat not only for Vijay fans, but to everyone and has been accordingly designed. The game has been designed based on 'Easy', 'Medium' and 'Hard' levels in accordance to the speed and momentum at which the game has to be completed. The game would commence in the backdrop of Chennai and would continue across the locales of Cochin, Mumbai, Delhi and Kolkata." The game's directors Pradeep Kulasekaran and Gowtham are sure that this game would be more engrossing and would offer a different experience to everyone. 'Vijay 59' to continue the success sentiment! Expectation shoots up for YNK ...! Salman Khan as a wrestling champ !! Vikram's action treat on Non-Violence day! Baahubali - The Highest ever ? When will Vijay be Vijay again? A smashing Friday thanks to Maari ? 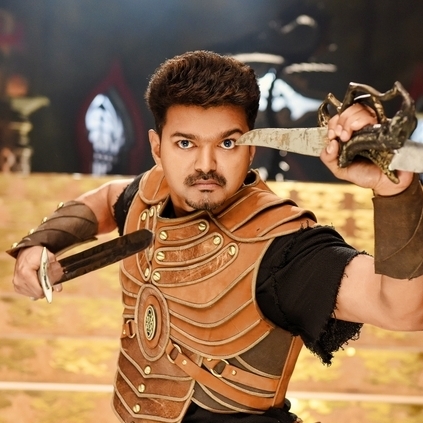 Vijay Starrer Puli's Satellite Rights Bagged By Sun TV. Vijay 59 To Commence With A Pooja By The 26th Or The 27th Of June? List Of Ilayathalapathy Vijay's Special Dance Numbers With Leading Heroines. People looking for online information on Clean India Mission, Clean India Mission game, Kaththi, Puli, Vijay will find this news story useful.